Two other top Iraqi officials narrowly escaped death in what appears to be a campaign to target key figures in the new Iraqi administration as it prepares to take power June 30. Elsewhere, an American soldier was killed and two others were wounded Sunday during an ambush near Taji, 12 miles north of Baghdad, the U.S. command said. One assailant was also killed. A U.S. Army OH-58 helicopter crashed Sunday near Taji, 12 miles north of Baghdad, but the two-member crew survived "in good condition," the U.S. command said. The command said there was no indication the aircraft was shot down, but the incident is under investigation. At least 10 people, including three Shiite militiaman, died in overnight clashes with U.S. troops in Baghdad's Sadr City neighborhood, Sheik Hassan al-Edhari, an aide to radical cleric Muqtada al-Sadr, said Sunday. 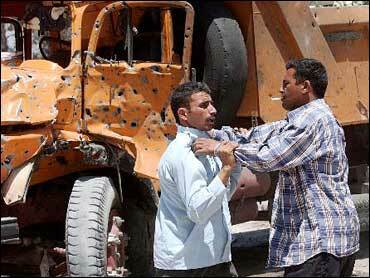 On Saturday, an Iraqi deputy foreign minister, Bassam Salih Kubba, was mortally wounded as he was driving to work. Kubba was an influential Shiite Muslim who had played a lead role in forming the new Iraqi government, reports CBS News Correspondent Charles D'Agata. The Foreign Ministry blamed Saddam loyalists for the killing. Underscoring those difficulties, a rocket exploded Sunday in the Green Zone, causing minor damage to the Republican Palace where U.S. administrator L. Paul Bremer maintains his offices. There were no reports of casualties, but U.S. Apache attack helicopters roamed the skies overhead looking for the assailants. In addition to the assassinations - the first against top government officials since the new leadership was appointed June 1 - two other senior figures escaped death in separate attacks over the weekend. Also Sunday, a car bomb exploded Sunday near a civilian convoy escorted by U.S. troops near Iskandariyah, 25 miles south of Baghdad. There were no U.S. casualties but one Iraqi civilian was hurt, U.S. officials said. But militants  both Saddam loyalists and those with radical Islamic motivation  have long considered Iraqis who cooperate with the American-run occupation to be collaborators. Although the new government is supposed to become sovereign, its top figures were all appointed in a process in which the American occupation authorities played a major role in the selections. Iraqis will not have an elected government until a national ballot planned by the end of January.